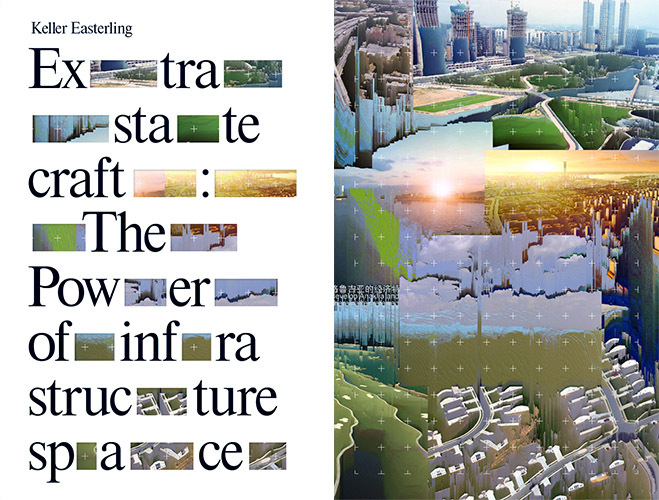 Keller Easterling, cover of Extrastatecraft: The Power of Infrastructure Space (Verso, 2014). The project delivers a compatible print and digital design for the book Extrastatecraft: The Power of Infrastructure Space. Extrastatecraft researches global infrastructure as not only urban substructure, but also the repeatable spatial formulas that constitute the urban structure itself. Some of the most radical changes to the globalizing world are being written, not in the language of law and diplomacy, but in the spatial manifest of infrastructure space—a defacto medium of polity. Neither report nor proof, but rather exercise or rehearsal, Extrastatecraft constructs an interplay between three fields of infrastructural evidence and three contemplations of the special form making and activism that this matrix space inspires. As a second stage of authorship, the digital/print design allows the book to enact its contents and reach a broader audience. Keller Easterling's publications, exhibitions, and designs research underexploited political and artistic agency immanent in architecture and urbanism. A forthcoming book, Extrastatecraft: Global Infrastructure and Political Arts, studies global infrastructure as a medium of polity. Her recent book Enduring Innocence: Global Architecture and its Political Masquerades (2005) exposed the political instrumentality of repeatable spatial products. A previous book Organization Space: Landscapes, Highways and Houses in America (1999) investigated twentieth-century American infrastructure in light of contemporary network theory. A number of projects have experimented with scholarship in new media formats: Call it Home, American Town Plans, Wild Cards, and ESC (an open-source website for publishing infrastructure research). She has published, lectured, and exhibited widely. A recent show Some True Stories (Storefront for Art and Architecture, 2008), strategically mixed fact and fiction in a presentation of urban inventions. Easterling's teaching and research often reach audiences beyond the arts in social and political studies.